Rush hour: The 16km to Tanglang La were the most difficult. To sell a concept, even to oneself, is one thing, but to execute it is another. Take my word for it, cycling 500km at an average altitude of 15,000ft through five Himalayan mountain passes (Rohtang, 13,090ft; Baralacha La, 16,500ft; Naki La, 16,000ft; Lachung La, 16,616ft and Tanglang La, 17,582ft), through the lush valleys of Himachal Pradesh into the high-altitude desert of Ladakh, is an arduous task. In September 2006, two friends and I went on a motorcycle trip from New Delhi to Leh via Manali. During our ride from Manali to Leh, we met a few young cyclists riding to Leh. That’s when I started to nurse the desire to travel on this famous road on bicycle. Soon, it had turned into an obsession. I knew I was attracted to the macho appeal of the trip rather than any actual athletic ability. Fortunately, my friends, Atul Kashyap and Gautam Kothari, thought likewise. In May, we started to train for our trip. I purchased a Trek 4300, a 24-geared model, for Rs18,000. Our training schedule comprised cycling 50-80km in the morning, thrice a week, for three months, around New Delhi. We hit the gym in the evenings. The whole family pitched in to help with logistic support and other requirements, such as medicines, puncture kits, oxygen cylinders and wheel spokes. Finally, on 31 July, we set out on the road from Manali through the pine forests and apple orchards of Himachal Pradesh. We went from the lush green Kulu-Manali valley, through slick, mud-covered rocks on the road, rocky moraines, past glaciers, into the wide expanses of the Morey plains (a distance of 40km at an altitude of 15,000ft), and finally entered the arid Ladakh desert. We also cycled through 21 hairpin turns of the Gata Loops. High altitude causes sickness ranging from nausea to high-altitude pulmonary or cerebral oedema. Luckily, we were able to acclimatize as we went higher. But we couldn’t breathe fast enough to get sufficient oxygen and our legs ached. Despite our exhaustion, sleep was not satisfying. We covered the trip to Leh in 11 days (nine days of cycling and two days of rest), logging an average of about 50km a day. The itinerary included Manali, Marhi, Sissu, Jispa, Patseo, Sarchu, Pang, Debring, Karu and Leh. The toughest part of the trip was the last 16km to the top of Tanglang La Pass. I began to experience high-altitude sickness. It was risky to cycle in that condition on narrow roads, with a drop of 2,000ft below. But having reached this far, I realized there was no going back. Only 16km to go. Doesn’t sound like much, but at the time it seemed nearly impossible. 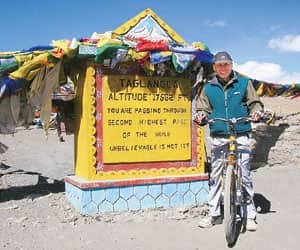 I alternated biking and walking, and with determination and prayers, reached the top. I was numb for a moment till emotion and realization struck. I had made it. Finally, we landed in Leh, the dusty capital of Ladakh. The Western Himalayas are the meeting point of the major religions of India— Buddhism, Islam and Hinduism. It is also the point of convergence of the Aryan and Asiatic Tibetan races. I realized after this trip that nothing is impossible. Just put your head and heart into all that you do. In my case, I added a pair of bicycle pedals too. I cycle twice a week even today.